Over the years, the Portland area has spawned a thriving and talented pool of rock musicians. On any given weekend, clubs around Portland and Vancouver are teaming with talented musicians that perform everything from original material, tributes, and covers. What many may not know is how tight knit that community of musicians is, and how they can pull together for a great cause. 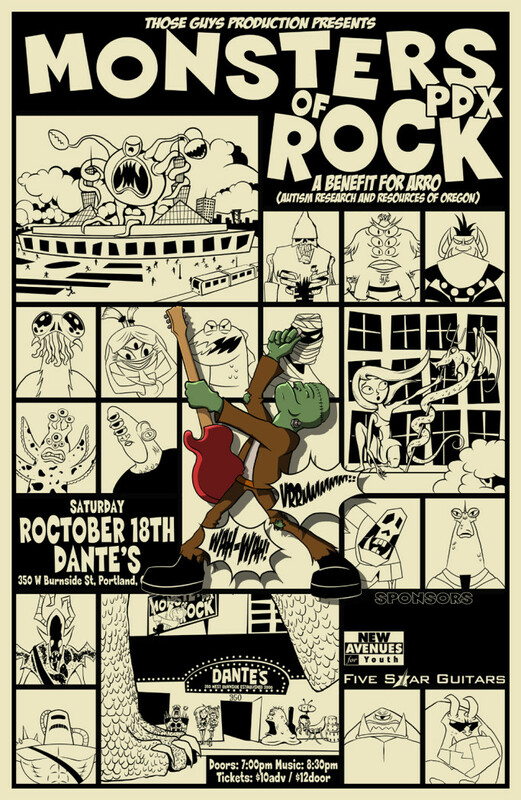 Now in its fifth installment, Monsters of Rock PDX is an event that will see up to 60 musicians perform rock classics from the 70s through to now on one stage. This isn’t a selection of bands, but rather organizers taking talented musicians in different bands and piecing them together into mini–sets. These “super groups” have performed everything from AC/DC to Led Zeppelin. The Rolling Stones to U2. Tool to Soundgarden. Black Sabbath to Judas Priest and so many more. Current members from tribute bands such as Stone In Love, Shoot to Thrill, Appetite For Deception, and Motorbreath share the stage with artists such as Jennifer Batten (formerly with Michael Jackson and Jeff Beck), Greg Georgeson (formerly of Sequel), Bill Wadhams (currently with the 80’s pop band Animotion), and others ranging from Andrew Paul Woodworth and Brian Harrison to Michael Allen Harrison and more. This year all proceeds after expenses will benefit ARRO (Autism Research and Resources of Oregon) and their Holiday Assistance program. In doing so, Monsters of Rock PDX and the players performing at it will help provide assistance to allow families that are supporting a child with Autism the chance to have a Holiday they might otherwise not have. This entry was posted in Concerts, Fundraisers. Bookmark the permalink.